David Gergen, CNN senior political analyst and former adviser to US Presidents Nixon, Ford, Reagan, and Clinton. (CNN) - I’ve never heard anyone ask CNN’s senior political analyst, David Gergen, about his role in developing one of the most memorable lines ever in a presidential debate. I've never heard anyone ask him about the message former President Nixon urged him to pass on to the new president Bill Clinton. Never heard him talk about the pocket of American politics that gives him real hope for our future. Never heard him talk about his mentors. Never heard him talk about the growth spurt that killed his baseball dreams – about the pitch that got away. I've never heard anyone ask him what he’d tell his four grandchildren about the world they will inherit. Now, we have the answers to those questions and more. Answers that reveal a side of David Gergen that we don’t see on the daily political panel discussions. You’ll only hear the answers by listening to this program. 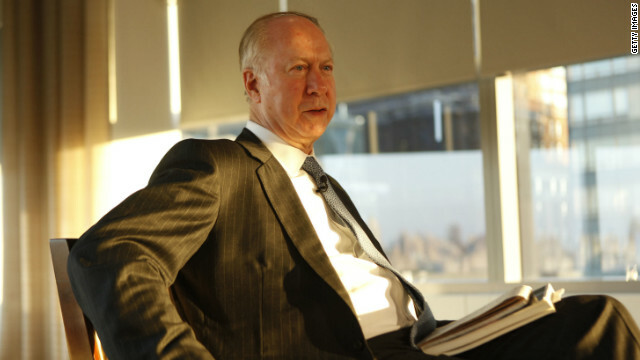 David Gergen, adviser to Presidents Nixon, Ford, Reagan and Clinton. Professor at Harvard’s Kennedy School. CNN’s senior political analyst. A man with a big family and big dreams for America’s future, here on CNN Profiles. Valuable info. Lucky me I discovered your web site unintentionally, and I am surprised why this coincidence did not came about in advance! I bookmarked it. Took his "Art of Communication" class few years ago and was awesome! He had great political stories and was a very engaged prof. He would sometimes show his political lean, but was always more interested in striving for good governing and leadership. I like Gergen's professionalism because he never appears to take sides, he likes to speak from honesty. That Alex C. guy and Bennett are mean old men, especially Bennett. David Gergen is about the only analyst that I respect and enjoy hearing. I believe that he is fair and honest and I for one would really like to see him involved in a show "Political Oasis". I would watch. Get people from different sides with some of the same ideas and ask them, "How can we get this done?" He was surprising quiet on the whole 47% flap. Me thinks he should have protested over the slighting of so many people who were thrown under the bus by that remark. lol? All of the criticisms on this forum just don't hold any water. *sigh* people..
Mr. Conventional Wisdom. Never seems to have any interesting insights. David Gergen would be one of those people that I would LOVE to sit down and have dinner with. I very much enjoy hearing his political perspective and respect his opinion. He's a real white, conservative comformist, with no creativity . He has lilly soft hands too. At one time I admired and respected his views as a fair minded republican. But lately he has paniced and is no longer fair minded but just another GOP hack.